Plant City High School’s JROTC cadets brought home two district championships and are headed to show off their skills at state. Few students show the dedication and fervent discipline of Plant City’s JROTC cadets. This year they’ve upped the stakes by taking home the district champion title for the mixed color guard and duel exhibition teams and are turning a determined eye toward states. They hope to bring home more titles for the teams. Breanne Williams. The mixed color guard are headed to state to compete against their peers. This is the first time Danny Ramirez, commander, and Ivan Amezquita, left guard, are going to states. However, it’s the second year in a row PCHS has represented at the competition with its color guard and exhibition teams. They won’t find out until a week before the April 13 competition at George Jenkins High in Lakeland when they’ll be scheduled to compete. The nerves are starting to creep in and the team is practicing nonstop in an attempt to obtain a perfect routine. Courtesy photo. PCHS’s JROTC mixed color guard became district champions. The cadets all have adopted a “help thy neighbor” mentality and will frequently chime in and offer advice if they see something either in their own routine or even on their school’s other JROTC teams that could be improved. They also stray from the normal mindset and focus on ensuring their routine has a “wow factor” even if that means it’s more risky to accurately pull off. In color guard, one wrong move could mean drastic reductions. A tiny mistake that would be minuscule to an average observer could bump the team down several points. When districts came the PCHS students stepped into the box and gave it their all despite several of the members worrying over other competitions and Mendoza feeling physically ill. They all agree there were small errors in the routine that caused most of them to believe they were done for. When the announcement came for second place and Dixie Hollins was called — which the students say is routinely the best school in the area and someone they all look up to — they let out a deep breath convinced there was no way they had even placed. When their name was called as the district champ, the reactions varied from staring with open mouths in shock to ecstatic screams. Breanne Williams. Lorena Correa and Daniela Cortez are new to duel exhibition, but still managed to make an impact at districts. The two champions in duel exhibition had never even participated in the competition prior to this year. Under the guidance of their peers, including Mendoza, they quickly learned the complex routine and spent countless hours drilling with the rifles. Many times they walked away with bruises, but eventually they learned to trust each other and trust their own skills. Her partner, Lorena Correa, said they both had to start out learning the foundational knowledge of the craft before they could transition into perfecting a routine. Because they were brand new they were striving to merely place at districts and were blown away when they heard they had come out as champions. Courtesy photo. Lorena Correa and Daniela Cortez are now district champions and are ready to show off their skills at state. The students also learn to support each other every step of the way. 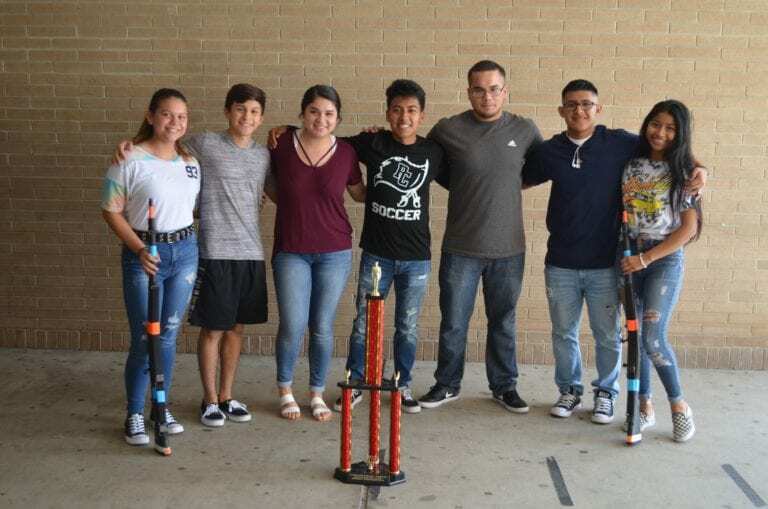 Mendoza was on the exhibition team that went to state last year, however, she and her team decided to spend their free time teaching the younger cadets how to be the best they can be in the competition they all love. Instead of going for another championship they decided to dedicate their time for others, a mentality they say many in ROTC practice. All seven of the students said they came to ROTC expecting to just enter a normal class and quickly realized the program was changing their lives. Some learned they had the confidence to be a leader, others gained the trust in themselves that allowed them to break out of their shell and begin to shed their shyness. Many walked into the program feeling like they were floating through high school only to suddenly find they had a new family in their fellow cadets.